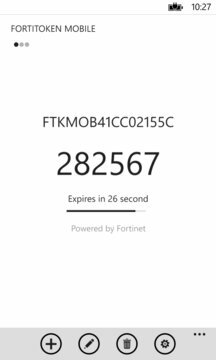 Published by FORTINET TECHNOLOGIES CANADA INC.
FortiToken Mobile is an OATH compliant, time-based One Time Password (OTP) generator application for the mobile device. It is the client component of Fortinet’s highly secure, simple to use and administer, and extremely cost effective solution for meeting your strong authentication needs. You can use FortiOS (5.0 or higher) or FortiAuthenticator as the back-end validation server. FortiToken Mobile also supports third party OATH tokens.